It is important to ensure that the basement stays to become a usable and dry space, which means that you need to keep water out at all times, which can be a rather difficult task. The most important thing is to capture water before causing any damage and it needs to be moved swiftly to the evacuation point. For this reason, we need to have a good quality basement sump pump to keep the basement completely dry. But, once you have the sump pump in place, it is important to ensure that you can get all excess water to it. The sump pump should have a proper chamber and there needs to be a route that allows water to get into it easily. In older basement, the sump is often surrounded by bricks and it has small header tanks. It needs that in unusual situation, the whole system would be able to cope with the excess amount of water that enters the property. If you want to quickly move the water away from the basement, you need to have proper arrangement of wall and floor junction channels. You need to use concrete to displace water to the appropriate spot, so the Basedrain perimeter channel can intercept it, then the water can be directed to the sump pump. In the end, it’s about moving the water into the sump pump chamber more quickly, compared to allowing the water to cause damage to the basement. In order to do this, you will need the right kind of pump. Problem may arise if your pump is underpowered and can’t move water quickly enough to the evacuation point. The technical term for this situation is “lack of head”. You need to check the pump for the size of the head, you need to match it with the distance and height of the evacuation point. You also need to know about the pump’s discharge bore and you may not have a good arrangement, if the pipe size is only 22 mm. Also, you need to check the float switch type that’s attached to the sump pump. Some affordable pump may have dangly floats that are susceptible to fouling on the side, which cause them to get disabled. This is obviously a bad thing, especially if you need to rely on the sump pump to ensure an entirely dry basement. 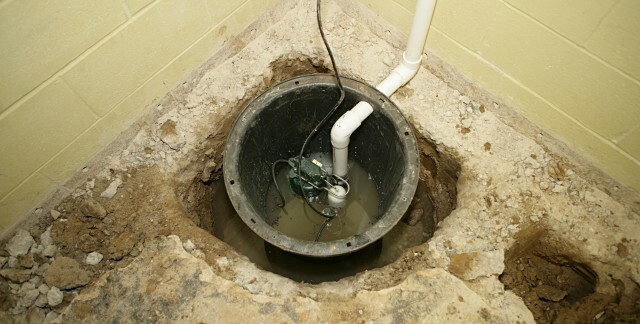 When choosing sump pump for your basement, it is important to make sure that it has excellent track record. You also need to consider a few things when you also need to pump grey water with the basement sump pump. In this case, you need to have heavy duty, good quality floats that won’t be fouled up with debris, hair and soap suds. This is especially true when there’s a bathroom in the basement. The sump pump should also have airtight lid and seal, because grey water could cause nasty smells inside the basement that is quite hard to remove.